Headquarters USA 2019, 41st Ed. Headquarters USA lists headquarters and other central offices for the largest and most important businesses, organizations, agencies, and institutions in the United States and Canada. 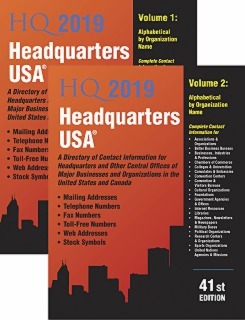 The 2019 edition of Headquarters USA contains over 130,000 listings, presented by name and by subject. Listings are presented in both alphabetical and subject classified volumes and provide company or organization name along with its full address and telephone number. Most listings also include fax numbers, web sites, and toll-free telephone numbers. Trading symbols and corresponding stock exchanges are also provided for publicly traded companies. With this comprehensive directory, you and your patrons can find verified, accurate, up-to-date information for all types of businesses, industries, and related organizations.